President Buhari campaigning in Delta State. 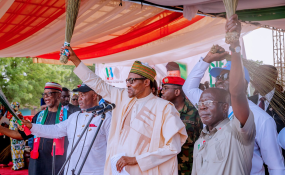 The campaign trail of President Muhammadu Buhari was in Warri, Delta State, on Thursday as the president continues to solicit for votes for his reelection bid. Mr Buhari at a campaign rally in the city told a crowd of supporters he was not ready to back down on his anti-corruption fight. On the stage where he spoke from, Mr Buhari was sandwiched by Great Ogboru, the All Progressives Congress (APC) governorship candidate in Delta State and Adams Oshiomhole, the national chairman of APC. Also on the stage was Godswill Akpabio, a senator and former governor of Akwa Ibom State. "Let us realise it and thank God and work together to build our country. "I assure you the fundamental objectives that we campaigned on in 2015 are still relevant. The country has to be secured to be properly managed. And proper management means doing well in the economy. "We have a young population, and most of them are unemployed. This is of great concern. "We have turned to agriculture and industries, most of our young people have been mobilised, they have gone back to land (farming), and they have not regretted it," the president said. He insisted that Nigeria has achieved food security. President Buhari acknowledging Delta's "influence" on the nation's economy because of crude oil exploitation in the state, said his administration would take the development of the Niger Delta region "even more seriously". He asked the people to cooperate with the government and also "vote for APC from top to the bottom". Speaking earlier, Mr Ogboru said corruption in Nigeria has 'dwindled' under Mr Buhari's administration. Mr Ogboru also called the president an "anti-corruption czar", "the general of all the generals in Nigeria", and "the father of the nation".